ã0.2-0.6S TRIGGER SPEED & 120Â°WIDE ANGLEãUnique sensor design provides this game cam with 120Â°wide detection angle and impressive 0.2-0.6 second (Pre boot 0.2 second) trigger speed which makes sure each detected movement is documented in real time. Effective shooting up to 20m/65ft, 3 PIR design makes sensing angle reach 120 degree. Built-in Mic records sound of animals. Users are guaranteed to never miss any of the action. 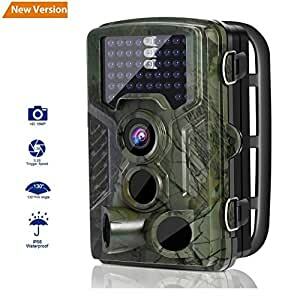 ã16MP 1080P HD RESOLUTIONãProgrammable 3, 5, 8, 12, 16 Megapixel high-quality resolution captures crisp, brightly colored photos each time motion is detected of wild game during the day (black and white at night). The 1080P @25 fps Video is at your fingertips, records clear video and sound (support 3s to 10minutes video length). Adjustable resolution are available for both still images and videos. ãLOW GLOW INFRARED TECHNOLOGYã Equipped with 46 pcs infrared LEDs, and 850NM with very low glow red flash,takes wonderful images, thus aviod producing such bright flash which scare animals away when taking pictures. STORAGE: TF CARD/ MICRO SD CARD (CLASS 6 )WITH MINIMUM CLASS6 UP TO 32GB (NOT INCLUDED). ãRELIABLE & DURABLE MINI GAME CAMERAã The LESHP deer trail camera is designed to be waterproof(IP56), solid, sturdyportable (only 5.3×3.5×3.0 inch). Powered by 8AA batteries(not included). The long battery life can last up to 8 months in standby mode. You can leave this motion activated wildlife camera strapped to a tree or mounted on a wall for long period of time.